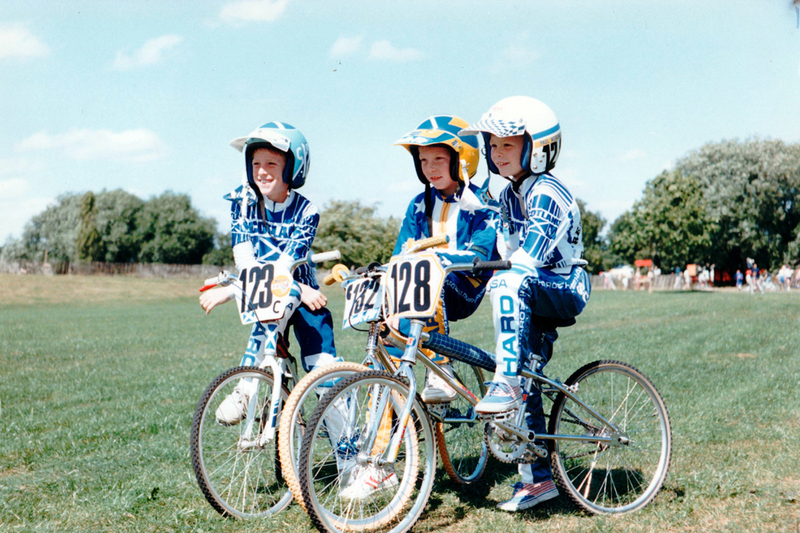 It’s not hard to get Sir Chris Hoy to talk about bikes — even ones that don’t fit him anymore. “My first bike was a second-hand one from a jumble sale. My dad resprayed it and pimped it up with BMX handlebars and grips and put some stickers on it. I absolutely loved it, and within a couple of weeks of learning to ride a bike I was wanting to do jumps. So I used to build ramps in the back garden — I would have been six years old then. I snapped the frame within about three weeks. I’ve always been heavy on equipment,” he laughs. So, when it came to creating some mini-pedal machines that bear his name, it wasn’t hard to tap into those old memories. “It’s a whole different part of cycling and bike design that I’ve had to learn about, but I knew what I liked when I was a kid. When I think back to my BMX bike, I used to race with narrow rims until I got a bit bigger, I’d be racing on a BMX track with 1 1/8in rims. So you don’t necessarily need to have great big clunky wheels that you sometimes see on children’s bikes. With that philosophy, the new range of Hoy Bikes children’s models were born. There’s the Bonaly mountain bike (£230-£320) available in 16, 20 and 24in wheel sizes, named after the foothills of the Pentlands where Sir Chris first went venturing off-road. The Meadowbank singlespeed bike (£270-£320) available in 20 and 24inch wheel versions, named after the legendary track. The Cammo (£400) is a 24inch-wheeled mini drop-bar road bike inspired by a great road section in Edinburgh. And there’s even a BMX-style 12in-wheeled Napier balance bike (£110) for little ones who are still finding their feet. “I’m really excited,” Chris enthuses. “I think it’s nice because this time last year we launched the Hoy Bikes brand and this is a big step forward again, although in a slightly different direction. It’s been quite a long time in the pipeline, but the first time I saw the children’s bikes altogether was only about a month or so ago when we were doing the photo shoots at the various locations that the bikes have been named after up in Edinburgh. All of the bikes feature extra-short cranks to allow for a lower bottom bracket position to help increase stability, as well as aluminum forks and integrated headsets to ensure weight is kept to minimum. “As we put the bikes together I started with a list of what I didn’t want. I don’t like seeing things that have been done purely to attract kids and make them think they want that bike, but not actually make it a bike that’ll be good for them to ride. So we don’t have things like suspension on our bikes. Instead we’ve focused on making them handle as well as possible, making them fun to ride, and making sure all the basics are correct, such as brake lever reach being just right for little hands and then making sure brake power is correct for them. The Hoy Bikes UK Tour will also be happening again — appropriately enough, during the upcoming schools’ half-term week — where anyone can ride with Chris and see the bikes in person. The Tour will be visiting London on May 27, Liverpool on May 28 and Scotland on May 29. To find out more, visit the Hoy Bikes website.